For a few years now, we’ve spent a week or two somewhere in the UK to enjoy the local beer. This year, we first went to London to visit the Great British Beer Festival and Fuller’s Brewery, and then moved on to Whitstable for a week in Kent. We had initially chosen Kent and Whitstable simply because we had never been to Kent before, and because Whitstable looked nice enough to stay there. Kent is often called the garden of England, and it is nowadays not only a place with a significant fruit and vegetable producing industry, it is also the largest hop growing area in the UK. When driving through Kent, it became noticeable for us that there were a lot more oast houses to see than hop gardens. Oast houses are very distinct buildings with a round tower with a conical roof, often tipped with a distinct white cover. 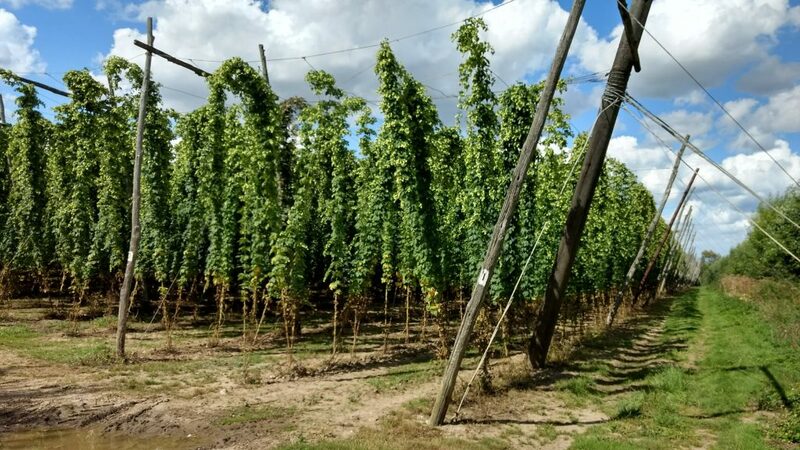 These were used to dry freshly picked hops, and the large amounts of them bear witness to a much larger hop industry than there is nowadays in England. A few weeks before we left for our holidays, fellow Stammtisch goer Joe told me about how Thanet in Kent, in particular Margate, Ramsgate and Broadstairs, is micropub central, and so we started looking closer into that, only to discover an aspect of British beer culture we’ve never witnessed before. So what are micropubs? Essentially, they’re tiny, independent pubs that focus on their main product, beer, and often cider as well. It’s often just one room for customers, a back room with casks of beer and boxes of cider, and a customer toilet, though some may be a bit larger. The beer is often served straight from the cask, so most micropubs don’t even bother with handpumps. 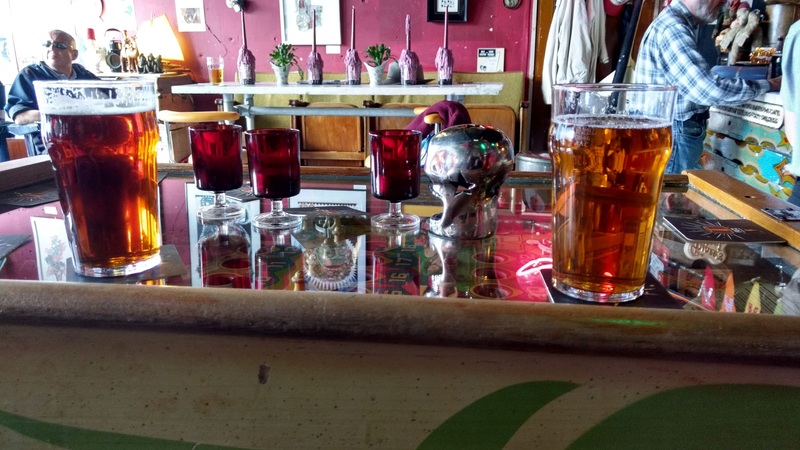 And from what I could see, that straight up attracts the beer nerds: during our visit of different micropubs, I’ve heard many people discuss the specific beers being served, or other general beer-related topics. Whenever people learned that we live in Germany, the topic of German beer often came up, and people are genuinely interested in hearing about and discussing the finer details of German beer culture, and just love talking about the local beer and their preferences. 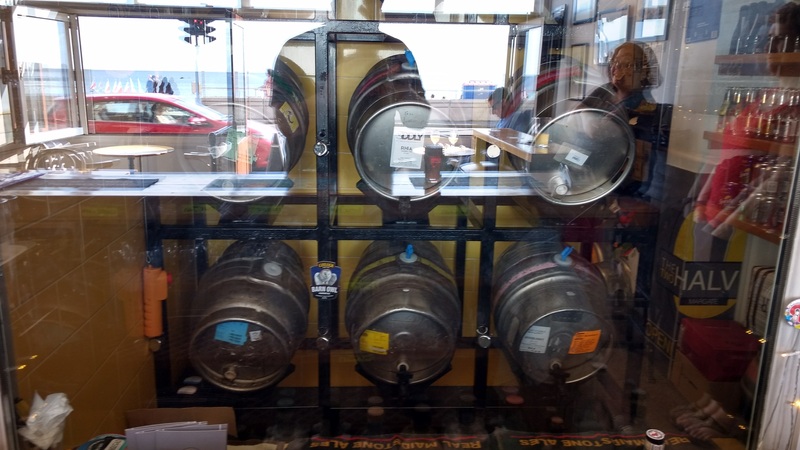 Publicans of micropubs also very much put an emphasis on good quality ale, often focussing on local breweries, and therefore are very much behind the idea of serving just great beer. In one instance, we’ve overheard two micropub employees and a regular discuss a particular firkin that had been delivered three days ago and hasn’t dropped bright yet, but instead developed a slight vinegar note, and whether they should return that firkin. So quality is a hot topic, and it’s openly being discussed to a certain extent. This is a refreshing difference to some other pubs that may serve you a slightly off pint with hints of vinegar, either due to economic pressure of having to sell the whole cask, or because they simply don’t care. But even outside the topic of beer, I found all micropubs to be more communicative than any other pubs I’ve been to before. In the majority of places, we just casually struck up conversations (well, my wife did, I’m too socially awkward) with either the publican or other customers, and people were much more open to just having a casual chat. For me, that was noticeable as the biggest difference compared to most other pubs. The biggest contrast in Whitstable for me was the local ‘spoons versus a micropub close to it, the Black Dog. For those who don’t know, J.D. Wetherspoons (often abbreviated to just ‘spoons) is a British pub chains with well over 1000 pubs all over the UK with attractive prices for both their beer (which is usually reasonably well kept but mostly consists of big, national brands) and their food (which is often pinged in the microwave or deep-fried). People we met in a micropub in Ramsgate recommended to us to visit the Peter Cushing (the ‘spoons in Whitstable, named after the actor which some of you may know as Grand Moff Tarkin) for its grand interior. It’s in a former theatre and is decorated in a art deco style which I found looked very good and much better than most other ‘spoons which are usually a bit trashy and scruffy. Even the pattern of the carpet, which is unique for every Wetherspoons pub, matched the whole art deco theme. But while the pub itself looks beautiful and serves cheap drinks (I paid GBP 2.09 for a pint of bitter from a local brewery near Maidstone), it’s not where I would go to relax or meet people. Now contrast that with the Black Dog. 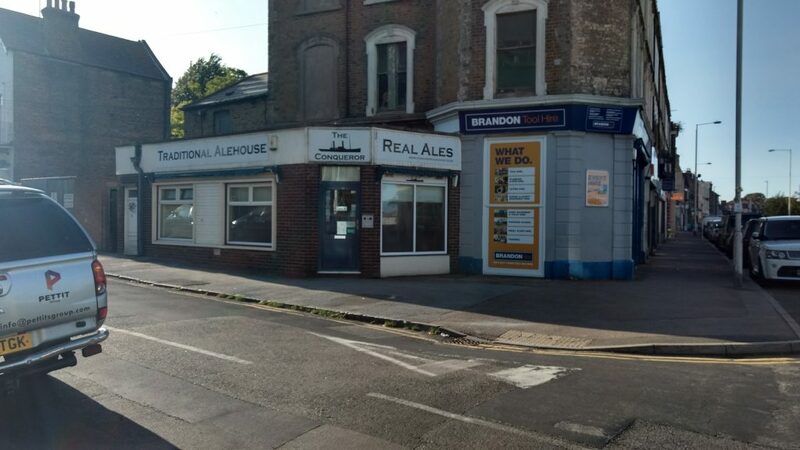 It’s a micropub in Whitstable probably a minute away from the Peter Cushing. It’s quirky-looking on the inside, the bar features faux handpumps which are just there to hold the pump clips of what beers are on, but it’s so much more inviting than the ‘spoons. The beers were mostly local, and with pints of GBP 3.00 to 3.50, the prices were higher but still okay and seemed to reflect a fairer pricing towards the brewer (Wetherspoons is known for not paying a whole lot to brewers for their casks). The raised benches and tables on both sides of the room may not be quite as comfortable, but provided an environment that just allowed you to chat to the people next to you. And I think that’s exactly what attracts people so much to micropubs: the conversation, the social aspect, the – as you would say in Ireland – good craic, paired with usually a good selection of beer and cider curated by people who are deeply passionate about the pub and the beer they serve in it. The “micro” in micropub in my opinion not only refers to the size of the pub itself, but also to the minimalism of the whole concept: minimal infrastructure for people to buy pints of cask ale, hang out and have a good time, accompanied by a few bar snacks and maybe games, but that’s it. No free WiFi, no (or only very quiet) background music, no annoying slot machines. And that’s all you need to provide people with an experience they can enjoy. Since the first micropub, the Butchers Arms in Herne, opened in 2005, about 300 micropubs have spawned in most parts of England, and a few in Scotland and Wales. I would like to see even more places like these, not just in the UK, but also in Germany. In Berlin, the place that I know that comes closest to a micropub is probably Försters Feine Biere: it’s very small inside (though you can sit outside during the summer), has no noticeable disturbance through background music, the food is limited in choice, simple and well-suited for a beer pub, and the owner is deeply passionate about the quality and selection of beer he serves. Due to the focus on German beer and in particular quality German lagers and regional beer styles, the choice of beer is different from your English cask-ale-serving micropub, but the quality beer is still central to the place. But back to Kent: we didn’t just go there so that I could analyze and disect the concept of micropubs, we actually went there to enjoy the beer. And to do that, we went to plenty of places. Since that holiday house we rented was located in Whitstable, we first checked out the local pubs. The instantly liked the Black Dog on Whitstable’s High Street. As I said earlier, it’s quirky on the inside, and the beer selection has been great all the time we were there, so definitely a place I can recommend. The Tankerton Arms in Whitstable was a bit further away, a good walk along the beach side, but equally nice. 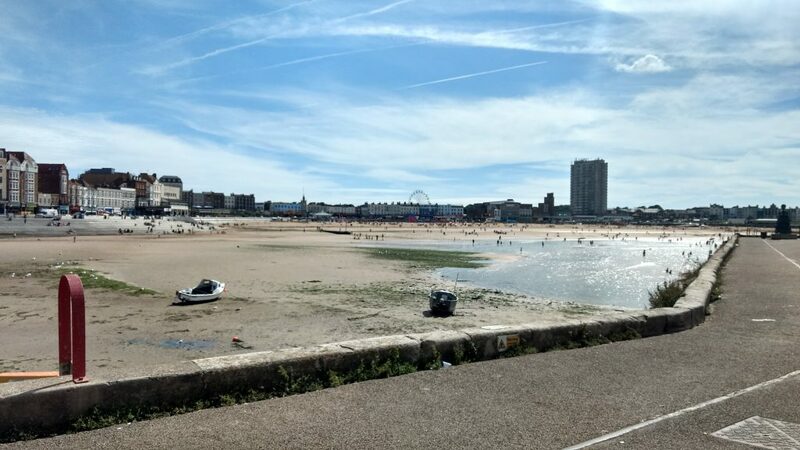 In order to get a good overview over the triangle of Margate, Ramsgate and Broadstairs that Joe had recommended, we decided to split our visit up over two days: the first day we visited Margate, while on the second day, we went to Ramsgate and Broadstairs. Our initial impression of Margate was not great: it looked like your typical tacky English sea-side town. Only on second impression, it turned out to be better, but I guess that’s just a resonation of our particularly bad experience in Scarborough last year. Our first stop in Margate was the Harbour Arms out on the stone pier. From there, you had a great look over the town. It was nice to sit outside and enjoy the sun, though we were put off a bit by a woman who turned out to be a Ukiper that talked about indigenous people in England (her mother was Irish, she didn’t get the irony), alleged riots in Ramsgate the day before, her claiming that the movie Whisky Galore was filmed on the Irish-Northern Irish border (it was not, we double-checked), and finally a bizarre monologue about subterranean worlds underneath Israel and Sinai and why there’s still hope for humanity because of them. And she wasn’t even drunk! We then moved on to the Little Prince, which was hard to find in the first place and then turned out to have run out of real ale. Due to very limited space, they usually only had bag-in-box real ale and two keg beers on draught. We had a half pint of Leffe and a bottle of Peroni out of pure politeness. The next stop was the Two Halves. 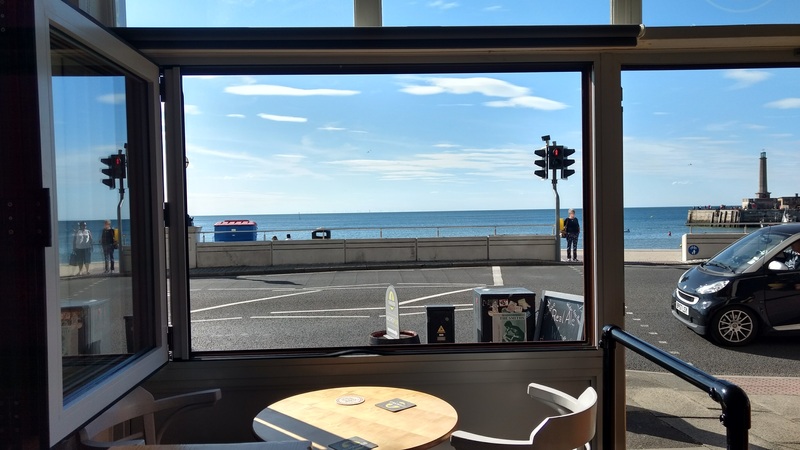 Now that was a micropub with a view! Very bright, a great view towards the harbour, and of course, good beer. The casks were prominently displayed behind a large glass window, so you could see everything that was going on. After a quick stop at the Bottle Shop, a craft beer bar, where we had a To Øl Sur Mosaic and a Thornbridge Lukas to cleanse our palates, we went to the Fez, another quirky micropub full of old beer-related signage. The beer there was great, as was the atmosphere. We had a conversation with a group of older men who, after they learned we were from Berlin and here on holidays, wanted to know about all the good beer places in Berlin. I also asked them why they specifically went to this micropub, the Fez, and they said, “oh, we go to many pubs”. One of them emphasized though that they enjoy micropubs because they are the quintessential pubs for them: good beer and a good place to hang out with friends. 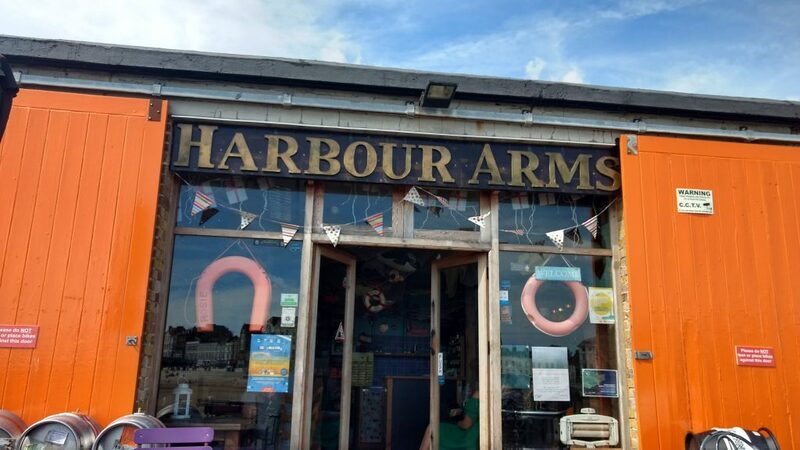 They also recommended to us two more pubs, one of them being a micropub we had on our list, but we eventually decided to return to Whitstable since we were hungry and time had passed a lot quicker than we had thought. The next day, we took the train to Ramsgate, where we first visited the Hovelling Boat Inn, which was okay but not too exciting, from which we moved on to the Conqueror Alehouse. There we met a couple which we had seen in the Hovelling Boat Inn earlier, and together with the publican and another couple that came in shortly after us, we had a nice and fun conversation. It was pork pie day, so slices of pork pie were served, which went perfectly with the well-kept beers. We then decided to move on to Broadstairs, since it was already getting a bit late and we still wanted to visit two more places. The atmosphere in this place was different, very vibrant, a bit loud, very welcoming and friendly locals, lots of them coming to the pub with their dogs, so we decided to stay for a few more and skip the second micropub in Broadstairs. All the house beers were good, solid bitters, nothing too crazy, but refreshing, hoppy beers for average non-hophead beer drinkers. The place also served cheese: they had a huge box with shrink-wrapped local cheeses, you picked the one who wanted to have, you got a plate with the cheese, a good amount of crackers and a lovely home-made onion chutney, and were charged based on which cheese you had chosen. A great deal, and tasty! We eventually had to get our train back to Whitstable. All in all, visiting all these micropubs was a good experience. None of them was outright bad, some of them were just okay, but a lot of them had a great atmosphere, and didn’t just serve good beer, but were also passionate about it. It gave me the feeling that what I had witnessed there represented how lots of people want pubs to be, a place to socialize and meet friends, a place to enjoy a few drinks, a place to relax and people-watch. I’m not qualified to say that this is how pubs were originally meant to be, but it’s certainly a type of pub I would love to see more often, and not just because of the great variety of local beers.